Are the woes of winter skin getting you down? Join the club! From dry patches to dullness, winter can play havoc with your skin. But that needn’t be the case when Nuxe has a skincare range that delivers 48 hours of moisture and protects against pollution. 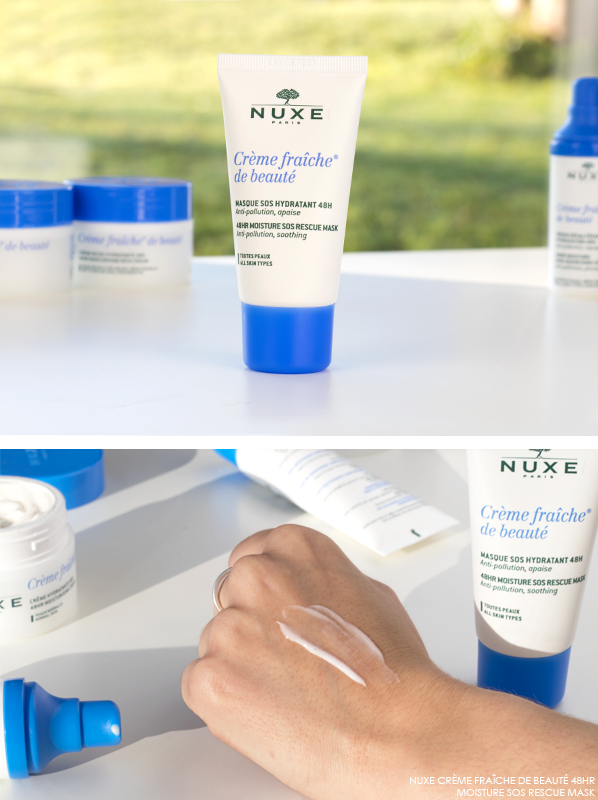 Yes, that’s right, the Nuxe Crème Fraîche de Beauté collection is your solution to winter skin, and if that’s not enough, it even has a new and improved formula and packaging! What’s special about Nuxe Crème Fraîche de Beauté? 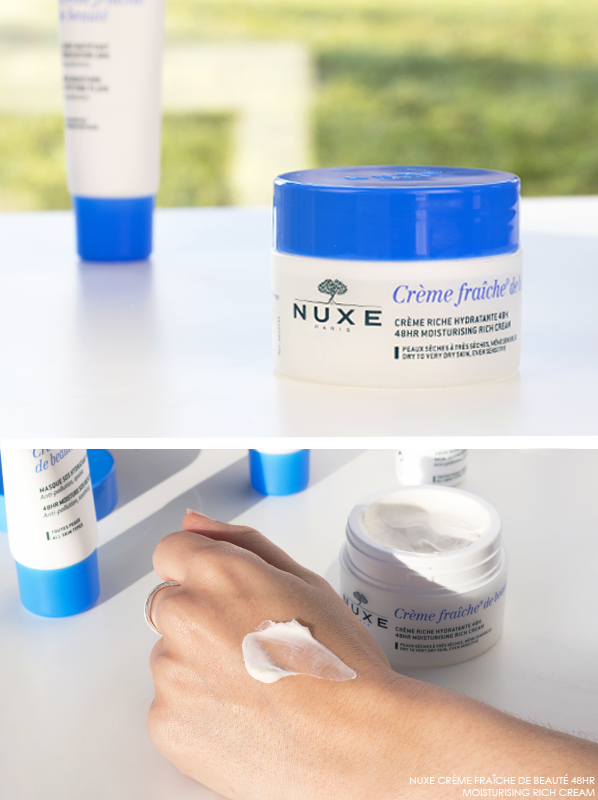 The question above should be: what isn’t special about Nuxe Crème Fraîche de Beauté? It really is a skincare collection that provides a solution to a plethora of skin concerns, however, its primary area of expertise is delivering skin hydration, 48 hours worth to be exact. But (and it’s a big but), that’s not it. 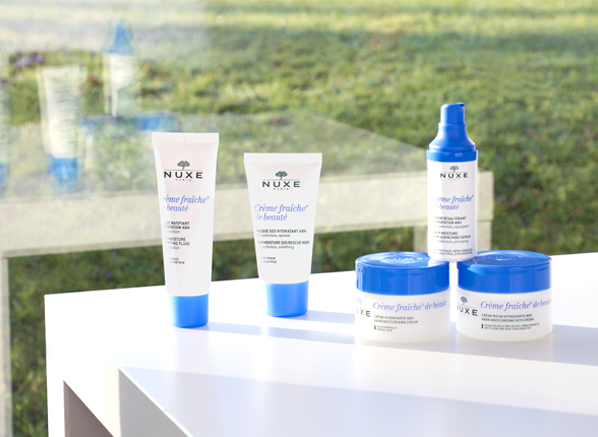 The original formulas did a pretty good job of combating dryness and dehydration, but Nuxe knew more could be done. So, for this update, they’ve gone from offering 24 hours worth of hydration to 48 hours. In addition, they’ve recognised that everyday aggressors can have a huge effect on skin health, so they’ve harnessed the power of high-tech algae extract, from the Baltic Sea and botanical milks to deliver deep moisturisation that acts like a shield against pollution. If you’re looking for intense, re-plumping hydration then you’ve found it with the Crème Fraîche de Beauté 48Hr Moisture Skin-Quenching Serum. A unique combination of 7 plant milks (acacia, blonde pea, green tea, almond, oat, coconut, soya) and hyaluronic acid give the moisturising concentrate its ultra-refreshing texture that melts over the skin, immediately soothing feelings of discomfort and providing 48 hours of skin-plumping hydration. Ideal for all skin types, including sensitive, the 96.4% natural origin formula can be used morning and/or night, resulting in skin that is fresh, soft, radiant and ready for the remainder of your regime. If you’re on the hunt for the perfect everyday moisturiser then your search can stop here. 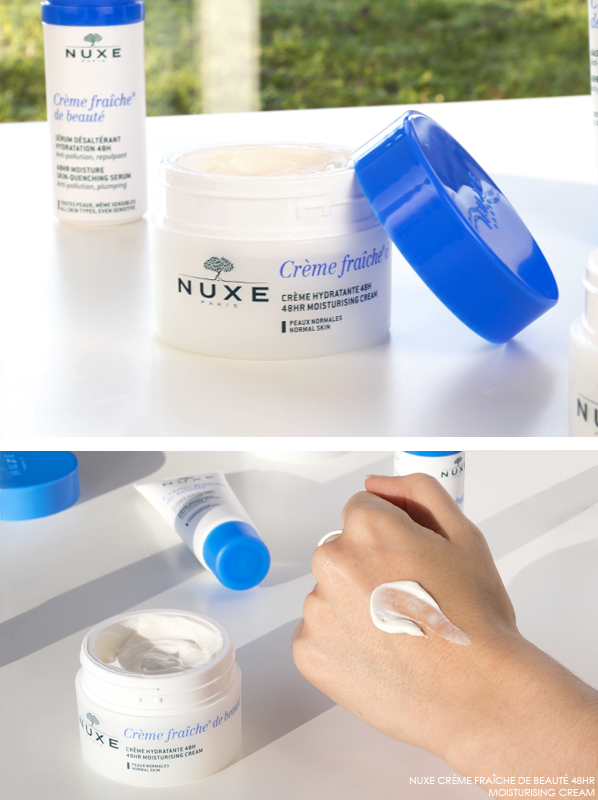 The Nuxe Crème Fraîche de Beauté 48Hr Moisturising Cream has a melting butter texture that cocoons the complexion in a veil of ultra-nourishing care thanks to added acacia, blonde pea, green tea, almond, oat, coconut and soya plant milks and protective algae extracts. Its indulgent formula feels luxurious and comforting on the skin, so it’s the ideal choice for the colder months. The next step after serum, this pampering cocktail also makes a wonderful base for makeup, leaving skin plump and healthy. 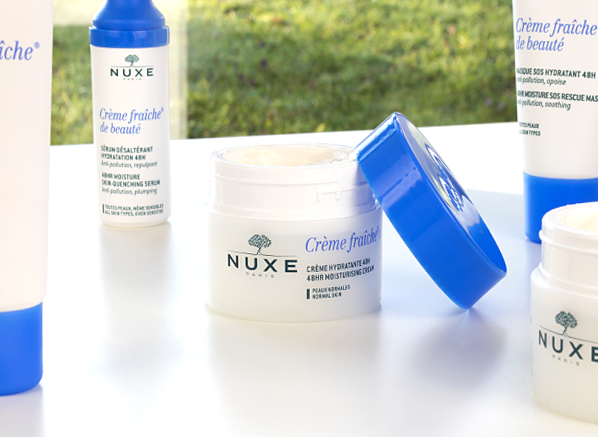 Sometimes a normal moisturiser just won’t cut it, especially if your skin is very dry, so, that’s why Nuxe has released the Nuxe Crème Fraîche de Beauté 48Hr Moisturising Rich Cream. The one to choose if your skin is crying out for a big boost of moisture, this rich cream has all the benefits of the normal formula, including added plant milks and algae extract, but has the addition of nourishing shea and moringa butters. Thanks to a melting texture, skin feels instantly relieved upon application, leaving skin that feels calm, nourished and velvety all-day. 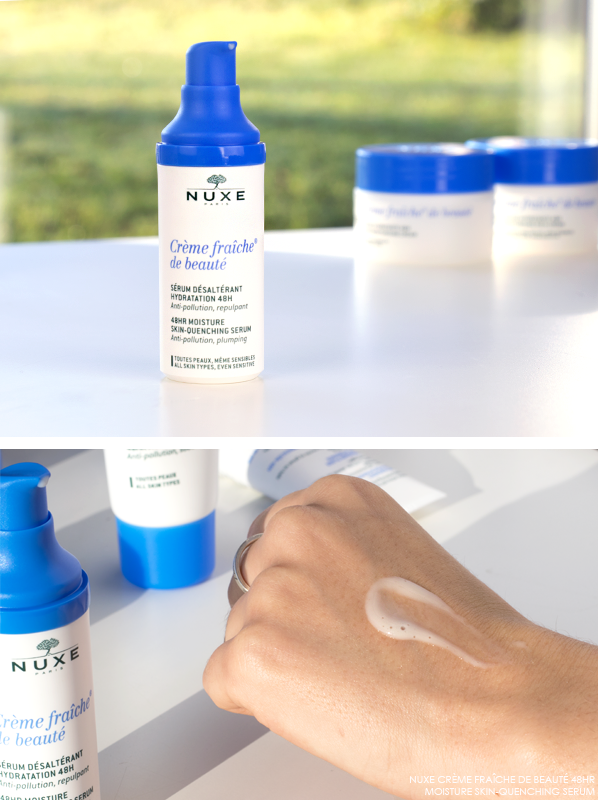 Even oily skin can feel dry and dehydrated and Nuxe hasn’t forgotten that. The Crème Fraîche de Beauté 48Hr Moisturising Matifying Fluid is the moisturiser to choose if you want all the hydrating benefits of the Crème Fraîche de Beauté range without a greasy finish. The fluid moisturiser has a powdery butter texture that dries down to the perfect makeup base, and it still has all the goodness and pollution protection from the plant milks and algae extracts – it’s the ideal combination for combination skin types! Face mask lovers rejoice because the Crème Fraîche de Beauté range has one, and it’s magic! The ultimate skincare SOS for dehydrated, dry and uncomfortable skin, the face mask can be used 1-2 times per week (or when needed) to soothe, calm and rehydrate the complexion. Like the rest of the range, you’ll find a winning combination of plant milks, plus the addition of white flowers, allantoin and natural origin hyaluronic, which all work together to relieve feelings of tightness, relax the features, rehydrate and of course, protect from pollution. This entry was posted on Friday, January 12th, 2018 at 9:53 am and is filed under Brand Focus, French Pharmacy, New products, Skincare, Spotlight On. You can follow any responses to this entry through the RSS 2.0 feed. You can skip to the end and leave a response. Pinging is currently not allowed.